Molly Goddard’s expansion from intimate presentation to large scale défile has been an exciting one. Waving goodbye to the life drawing lesson, the sandwich shop, the couture show, she ushered in an 80s-inspired rave which electrified London Fashion Week back in September. Her Fall 2017 show was characterised by the same ebullience and euphoria. The Tanks at the Tate Modern, reserved for the Topshop Show Space this season, were lined with banqueting tables and large. The models’ walk concluded in them taking a seat at the table, enjoying the party music which boomed overhead. It was a mise-en-scène and vignette of the Molly Goddard woman. One notable difference from her debut collection that became apparent last season is the emphasis on agelessness in the clothing. The first few collections were marked by their youthful, sugary saccharinity. The clouds of tulle that dominated those collections had an infantile flair that may have acted as a deterrent for an older customer. However, her mentors have advised her to encompass all woman, in the same way her casting does—it is a convergence of black and woman, tall and small: a refutation of the narrow beauty standards in the industry. There was pale blue nylon tops, a scarlet abbreviated jacket, striped sweaters, and photorealistic prints on long-sleeve tops. She aspired to promote a vision that appealed to all woman with those pieces and it works. Moreover, they all possess the signature Molly idiosyncrasies. Molly’s subversion of preconceived notions of prettiness is another point of intrigue within her collections. Since her debut, a subtle bleakness has pervaded her oeuvre. Despite the inborn charm of her tulle concoctions, there is something perverse to be found in the way she darkens her garments by blurring the lines between ugly and pretty, good taste and bad taste. The stylist put a red and pink striped sweater with cobalt ruched trousers, a black and yellow jacket with a lustrous silver skirt, an extravagant 18th century-inspired layered cobalt tulle number, on the runway. Coupled with the intensity of the heavy makeup, there was slight discomfort but also total captivation. The LVMH Prize nominees were announced a fortnight ago and Molly takes pride of place on the list, alongside the likes of Antonin Tron’s Atlein and Syrian-born London-based Nabil El-Nayal. 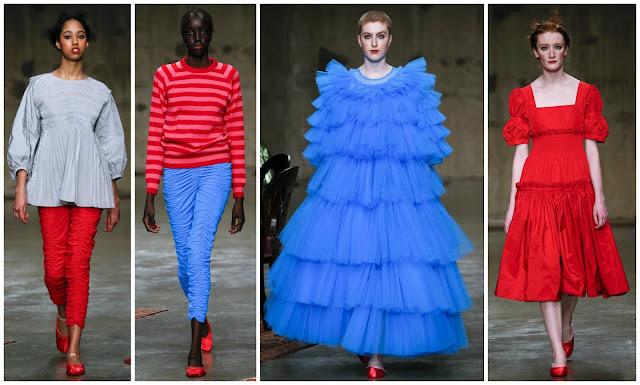 If Molly, like the Marques’Almeida duo and Thomas Tait before her, is to win the prize in June, what a fabulous collection to be off the back of. If she doesn’t, a prize giving doesn’t diminish her immense and incredible success—it merely would cement it.